Bonus Offer: You will receive a free Weiss Schwarz play mat with every 4 boxes of Weiss Schwarz Accel World Infinite Burst boosters pre-ordered!BURST LINK!! 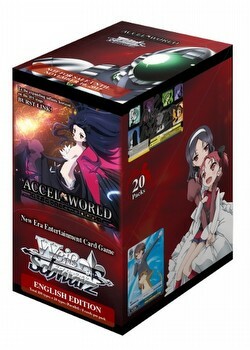 Let's head to the Accelerated World and beyond in Weiss Schwarz Accel World: Infinite Burst. Look for SP Gold Foil/Hot Stamped signed cards from various Japanese voice cast actors randomly inserted in packs. There are 100 cards in the set plus 20 parallels.